For a vacation unlike other areas around, North Myrtle Beach has the perfect combination of relaxing beaches and exciting yet family friendly nightlife. A perfect blend of old and new is exactly what North Myrtle Beach offers and for those looking for vacation rentals, Grand Strand Resorts has something to fit your family’s needs. Those with larger groups will be happy to find that our four bedroom condos in North Myrtle Beach offer excellent, choice locations. From oceanfront resorts to condo rentals in less crowded sections, our vacation rentals surely will suffice all needs. North Myrtle Beach has long been the younger cousin to Myrtle Beach, SC. Originally a hot bed for the older generations, NMB has now risen to become one of the premier family beach destinations in the state. With miles of beach, attractions such as the O.D. Pavilion and “Shaggers” with their world-famous dance, it is no wonder why condo rental inquiries have been accelerated. Forget the hassle of longer check-in times and see why more and more folks are considering North Myrtle Beach for their next vacation. The secret is out and everyone from couples to golfing groups are reaping the benefits of a NMB vacation rental. With this influx of larger groups vacationing here comes the need to provide more four bedroom units in North Myrtle Beach. 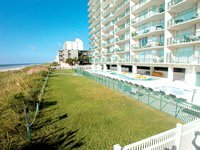 Search Grand Strand Resort's selection of four bedroom condos and resorts to find the precise accommodations best for you.